The first step, according to Overmeyer, is to develop a concept of the desired sound. Do this by listening to, and playing on, as many instruments as possible. The second step is to set a price range in which you will shop. The third step is to listen to the instrument you are considering, not only under your ear, but also from a distance and in a variety of situations (i.e. in rooms with varying acoustical properties, playing solos and in ensembles). The next step is to try and determine who has made the instrument. Since most labels have been altered over the years, this needs to be done by a knowledgeable dealer who can appraise the instruments age, origin and maker. You should then evaluate the condition of the instrument. Look for serious cracks, the quality of (he repair work and what percentage of the instrument is original. Finally, become aware of the hierarchy of makers. The old Italian makers of the 17th and 18th centuries such as Stradivarius, Guarnerius and Amati are at the top of this pyramid. There are many other fine older Italian instruments that are very valuable today. Later in the 19th century the important center for violin making moved to France where Vuillaume was the master craftsman. 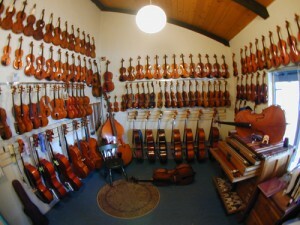 Today, there is a resurgence of violin making in the world. One can find beautiful new violins made in Milwaukee by Scott Sleider and fine instruments made by the Becker family of Chicago. Just remember, looking for a violin takes time and patience. It is a learning experience for you and your family. Wonderful website. Lots of helpful information here. I’m sending it to some friends ans additionally sharing in delicious. And certainly, thanks to your effort!